If you don’t know who Cyriak Harris is you probably haven’t been a reader of my blog. Cyriak Harris is a prolific animator and musician who twists samples of video into the most amazing distortions of reality, and accompanies these animations with his own original electronic music. Of all the music Cyriak has done for his videos, my favorite is a song called “No More Memory” which you can download for free. To me this song is an aural version of a Heros journey, a positive, minimalist 8-bit melody. And this is when I started to get really pissed off. How could Youtube give Sony Music Entertainment the ability to take down other peoples videos with no positive proof that they own ANY of the content of that video? Perhaps there is some image used in the video that Sony considers that it owns. How could this comic parody be considered anything other than a fair use of that imagery? It gets worse because Youtube will not make Cyriak a Youtube partner because of his videos use of sampled images/videos. The millions of views that his video gets could have gotten him thousands of dollars in order to invest in making more of his amazing art, but Youtube/Google will not allow this. 1. 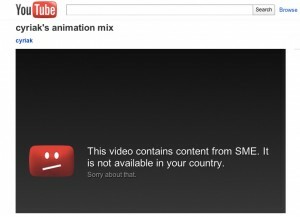 Go to the video page at http://www.youtube.com/watch?v=Ag-_SOihwwg – Click “report a bug” in the bottom left, and let them know that this video is not a violation of anybody’s copyright.